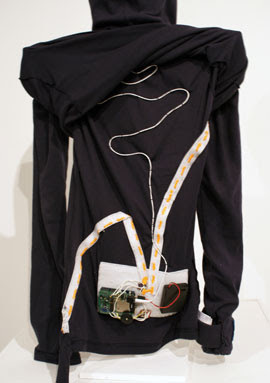 Designer, artist Lauren McCarthy, currently an MFA student in the UCLA Design / Media Arts program developed ‘Tools for Improved Social Interacting‘, a series of wearable devices that use sensors to condition the behavior of the wearer to better adapt to expected social behaviors. An interesting design concept that uses technology enhanced clothing to assist, train and support the wearer to ‘behave’ according to social expectations in a given life situation. At first you might think: ‘for what on earth do I need social interaction aid in my clothing!’. Does our increasing dependance on computer aided socializing via Facebook or Twitter make us unable to interact with real persons? This might become a problem in future but Lauren’s ‘Tools for Improved Social Interacting’ could proof to provide an interesting design for persons who need to (re)learn social interaction due to physical or physiological problems. ‘Tools for Improved Social Interacting’ include the Happiness Hat that trains the wearer to smile more. The smile size is detected via an enclosed bend sensor attached to the cheek. If the wearer stops smiling a servo motor moves a metal spike into the head proportional to the degree of smile. The Body Contact Training Suit requires the wearer to maintain frequent body contact with another person. If the wearer stops touching someone for too long, static noise begins to play through headphones sewn into hood. A capacitance sensing circuit measures skin to skin body contact via a metal bracelet sewn into the sleeve. The Anti-Daydreaming Scarf contains a proximity sensor detects if the wearer is engaged in conversation with another person. While he/she is, the scarf vibrates periodically to remind the wearer to pay attention and stop daydreaming. Three interesting concepts which use our second skin, our clothing as medium to assist and to influence our social interaction – inspirational and expandable. Lauren McCarthy’s ‘Tools for Improved Social Interacting’ can be found at SIGGRAPH 2010 from Sunday, 25 July through Thursday, 29 July 2010 at the Los Angeles Convention Center.